Both playful and studious, this youthfully designed soft-hued 22 metal storage file cabinet makes the perfect complement to the bedroom or study area of the student in your home. Ideal for both boys and girls, this intelligent storage cabinet is built to house all of the necessary school supplies a young scholar may need. Featuring a useful writing utensil drawer, a middle binder drawer, and a spacious and keyed entry lower file drawer perfect for storing expensive tablets or calculators, the learner in your life will love both the efficiency and fun colours of this academically inspired smart storage solution. Chrono 3-Drawer Filing Cabinet from Nexera features 2 catch-all drawers on metal slides at the top and 1 legal size filing drawer at the bottom. The filing drawer is mounted on heavy duty full extension ball bearing slides giving you full access to all of your files, even the ones at the far back. An anti-tilt safety device and adjustable levelers are also included for optimal use. Use the Chrono Filing Cabinet with the Reversible Desk Panel #211339 to create a flexible work station or pair it with other Chrono items to add storage and functionality in the living room and the office areas. Chrono Collection is entirely modular and offers unlimited mix and match possibilities to create your own perfect entertainment or home office room settings. This Nexera metal filing cabinet is a chic fix to your storage problems. Constructed with metal to keep your important documents safe and organized. Eliminate paper clutter in your office or home with this filing cabinet. 22 Inch Storage File Cabinet Green Both playful and studious, this youthfully designed soft-hued 22 metal storage file cabinet makes the perfect complement to the bedroom or study area of the student in your home. Ideal for both boys and girls, this intelligent storage cabinet is built to house all of the necessary school supplies a young scholar may need. Featuring a useful writing utensil drawer, a middle binder drawer, and a spacious and keyed entry lower file drawer perfect for storing expensive tablets or calculators, the learner in your life will love both the efficiency and fun colours of this academically inspired smart storage solution. 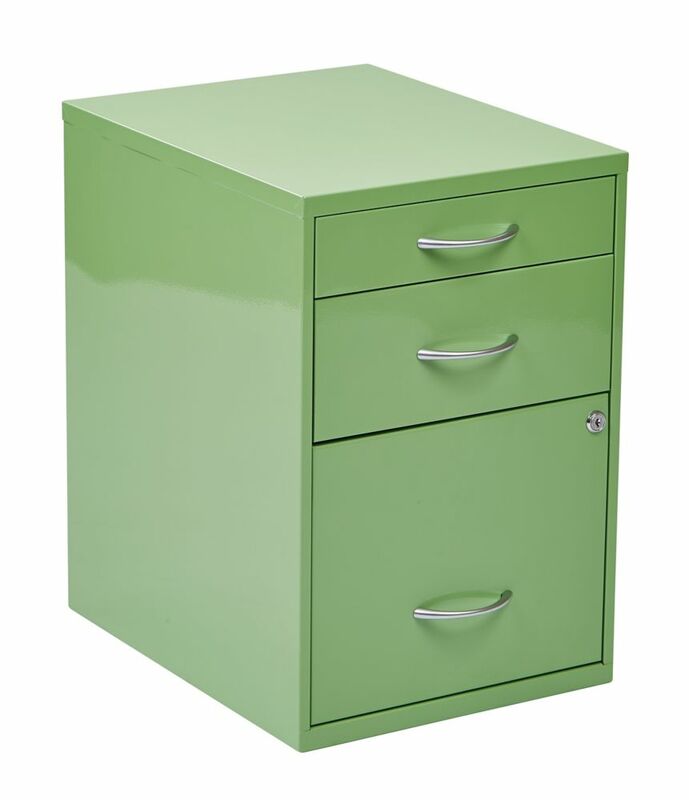 22 Inch Storage File Cabinet Green is rated 3.3 out of 5 by 6. Rated 2 out of 5 by COLDinLA from The cabinet was dented in the side where the lock... The cabinet was dented in the side where the lock meets the drawer. It still locks, so I'm going to keep it as I need it and don't want to be bothered with the return. I would not buy it again, however, as it is defective and may eventually not lock if that dent changes due to weight, etc. Rated 4 out of 5 by Jason from Pretty nice. Fits my needs. Thought it was... Pretty nice. Fits my needs. Thought it was a little on the light duty side. Rated 3 out of 5 by OrganizedGal from Nice color and size, and accurate description. It would be better if the whole cabinet locked ins... Nice color and size, and accurate description. It would be better if the whole cabinet locked instead of just the lower drawer. I ordered two, and both were dented when they arrive. Not damaged enough to return because I need them, but a new product should not show any damage. The shipping packaging was not torn or dented, so it was not damaged in transit. Rated 2 out of 5 by wi54703 from The bottom drawer was bent. ... The bottom drawer was bent. Rated 5 out of 5 by Yasmin from Cute file cabinet Super cute file cabinet! It's exactly as described and pictured. Durable and adorable!